JESUS IS RISEN! THE TOMB IS EMPTY! Jesus died for our sins... and rose to life again on the third day! Mary, his mother and Mary Magdalene found his tomb empty but an angel was there proclaiming Jesus Christ resurrected! 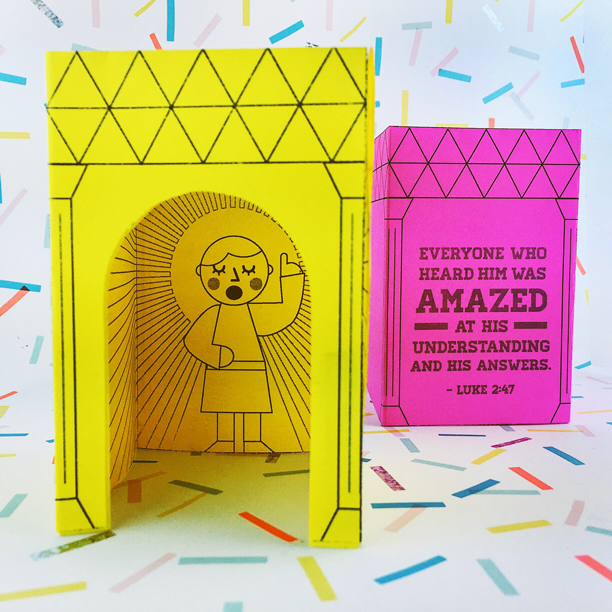 This 3D Paper pop-up scene illustrates the story of the Empty Tomb, perfect for Easter! Just fill in your first name and e-mail address and we'll deliver it to your email right now! YAY! Now check your email to grab your free craft and confirm your subscription. to know jesus + his plans for you. We hope this pop-up temple inspires your little makers to start growing in their knowledge of Jesus today. We believe you don’t have to be all grown up to know Jesus or to understand what he wants you to do with your life. Just fill out your name + email and hit "GET THE CRAFT" below to download your freebie. Then print the colored in version. Cut out all the elements and fold along the dotted lines. Then place all the characters and the Tomb into place. Jesus died for our sins and rose on the 3rd day. This is why we celebrate Easter! Use this craft to encourage your Little Makers to understand the significance of Easter today. Just fill in your first name and e-mail address and we'll deliver it to your e-mail right away! Before being arrested, Jesus went to a garden to talk to His Father. He was praying because He knew what His Father was asking Him to do and He didn't want to die. Even though Jesus was scared, He still wanted to do His Fathers will. We made this pop-up garden craft so that you and your little makers can remember what to do in times of trouble. No matter how scared or confused you are, you can go to your Heavenly Father in prayer knowing that He has a plan for you. Prayer helps us to understand God's will so that we can obey His commands, just like Jesus did. And it works even when we're afraid. Just fill in your first name and e-mail address and we'll deliver it to your email right away! ...and we obey what He tells us to do! We hope you keep this craft in your room as a reminder that Jesus did what he knew his Heavenly Father wanted him to do, even if he was distressed and scared. Then print the colored in version or the outlined one if you want to save some ink and color it in yourself! Wow – you're done! You nailed it. Pop some confetti and sneak a few goldfish cause you deserve it! Even though Jesus was sad and afraid, He seeked to do what his Father wanted of Him. This activity teaches us to go to our Father in prayer, and to obey his commands. Just fill in your first name and email address and we'll deliver it to your e-mail right away! wine that Jesus gives us. Then print the colored in version. Or print the outlines version if you want to save some ink and color it in yourself. Cut along all dotted lines and fold along solids. You can tape the opening to the box closed if you want. Then cut out the bread and wine and stand them up on the table, over the scripture. Jesus left us these symbols so that we can remember him, whenever we meet to break bread and drink together. Use this craft to encourage your Little Makers to grow in their knowledge + understanding of Jesus today! When Jesus entered Jerusalem on a donkey, crowds met him with branches laid on the road and loud cheering. This week’s craft is a pop-up paper scene, of Jesus entering the gates of Jerusalem, riding upon a donkey. We think its a fun craft to make as we kick off the beginning of Easter! Then print the colored in version. Or print the black and white version if you want to save ink and color it in. Cut out all the elements and then fold along the dotted lines. It's that easy! Jesus Christ (The Messiah) entered Jerusalem riding on a donkey as predicted by the prophets! This is a great craft to use for the beginning of Easter or Passion Week. This weeks craft is based on Matthew 14:22-32. In this story Jesus walks on water towards his Disciples. He kept them safe through a very scary storm as long as they kept their eyes and their faith on Him. This craft is an easy way to recreate the scene from Matthew 14. With a couple of folds, cuts and some paste, you can recreate this scene and remember to keep your eyes on Jesus through difficult times. faith in jesus keeps us afloat. We hope this craft inspires your little makers to put their eyes upon Jesus when life becomes difficult. Cut along all dotted lines and fold along solids. Then cut the elements and paste into place. Peter began to sink when he became afraid and took his attention off Jesus. But when he looked back at Jesus he was able to stand again. We hope this image inspires your little makers to put their eyes upon Jesus during tough times! This weeks craft is based on Matthew 19:14. This verse makes us giddy, because in it Jesus makes it clear that the Kingdom of Heaven belongs to little ones. 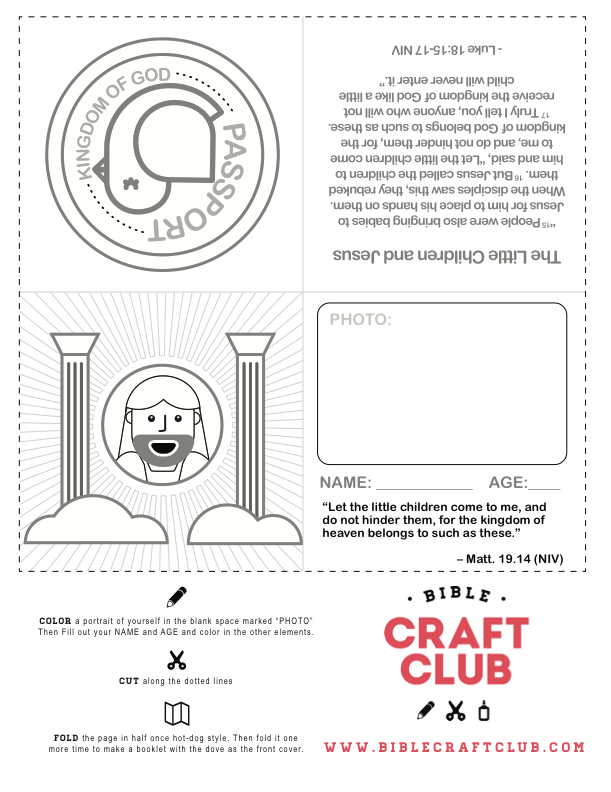 This week’s craft is a passport into the Kingdom of Heaven. We thought it'd be a cute way to communicate to your little makers that the Kingdom belongs to them! There's even a spot where they can color in their photo and add their name and age to personalize this activity. We hope this craft inspires your little makers to start growing in their knowledge of Jesus today. Just cut along all the dotted lines and fold along solids. You can color in your photo too if you want. Just because you're small doesn't mean you can't know + understand BIG things – like Jesus. This weeks craft is based on John 4:1-42. Jesus met a woman at Jacobs' well, and even though she was a sinner, Jesus offers her water that will never cause her to thirst again. 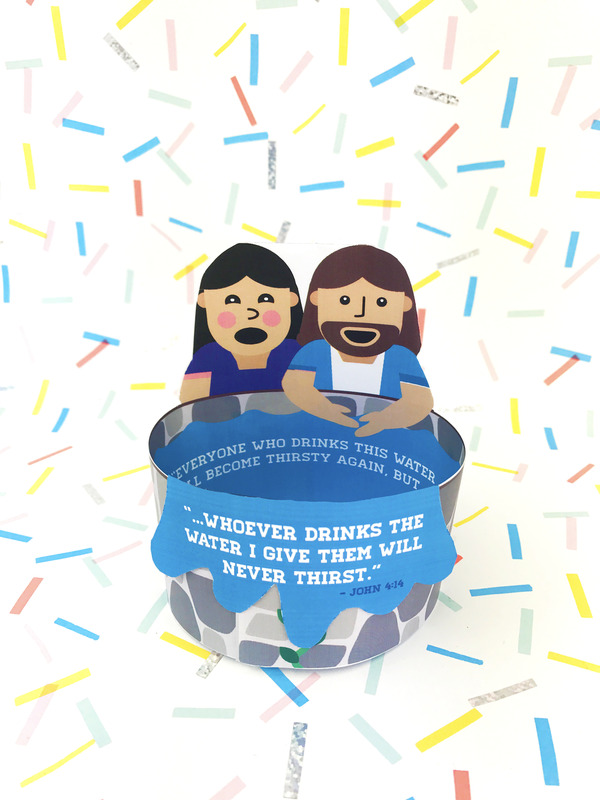 With this printable craft you can make a stand-up paper well overflowing with Jesus's words. 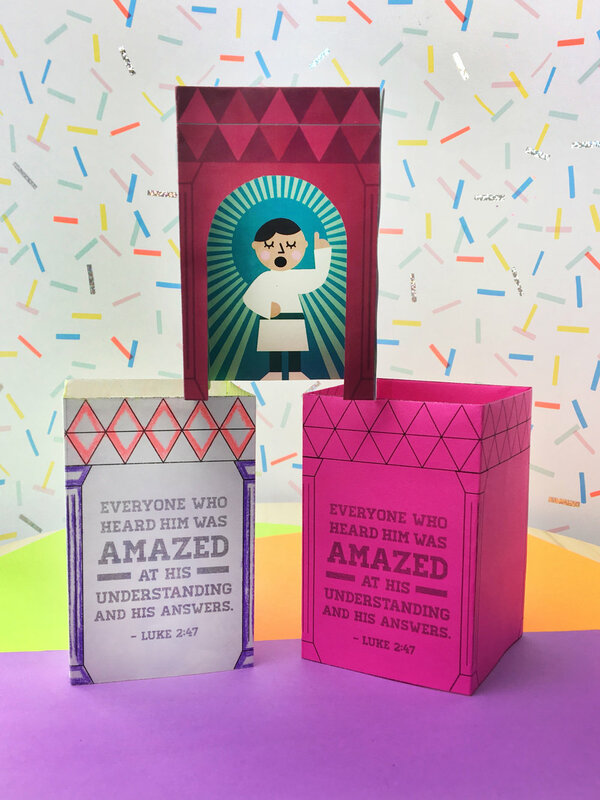 We hope this pop-up craft inspires your little makers to start growing in their knowledge of Jesus today. Cut along all dotted lines and fold along the solids. Then Roll the page around and attach it with glue to make the round part of the well. After that you can hang the scripture off the front edge of the well! We all get thirsty for things that don't ever fill us forever. Only a relationship with God provides quench to our thirst. Use this craft to encourage your Little Makers to grow in their relationship with Jesus. Jesus didn’t need a badge to know that He was loved by God. So what does this mean for you, little makers? It means that you are deeply loved by God because, just like Jesus, you are His child. But sometimes, we forget how much God loves us. So we thought we’d make a little reminder. This weeks craft focuses on the word God uses in Mark 1:11, Beloved, which means dearly loved. When we know we are loved, we can live like we are loved. Go on and download to begin making your “Badge of the Beloved”. Just color + cut so you can wear ‘em + share ‘em! There are 2 badges in this craft so you can give one away to someone who needs to be reminded that they are loved by God (it’s okay if that someone is you). We hope this craft inspires your little makers to own their identity as God’s Beloved. YAY! Now check your email to grab your free craft! YOU ARE DEEPLY LOVED BY GOD. It’s not just what you are, it’s who you are. You are Beloved. Just fill out your name + email and hit "GET THE CRAFT" below to download your "Badge of the Beloved". to choose your own colors. Cut out the circle badges and any of the 2 ribbons. Glue or tape the 2 ribbons under the circle badge at an angle. Use some masking tape to stick it to your shirt or tape a safety pin to the back to pin it to your backpack. Pop some confetti to celebrate being God's beloved! You are chosen + loved by God. It's not just what you are, it's who you are. Use this craft to encourage your Little Makers that their identity is rooted in the love God has for them! This week’s craft is a pop-up temple that reveals little boy Jesus inside. This is a simple and fun craft that lets your little makers meet Jesus as a boy, so they can see that he was small once too. Just hand ‘em some color, scissors and paste and let ‘em bring this craft to life! This weeks craft is based on Luke 2:47. This is the only story we have of Jesus as a boy. And it’s the only one we need. Why? Because it shows us that even at an early age, Jesus knew who He belonged to, where He belonged + what His purpose was. Just because you're small doesn't mean you can't know + understand BIG thing – like Jesus. Jesus was little once. The Wise Men brought beautiful + precious gifts to Jesus to celebrate his birth. But what can we give Jesus? That’s right!! It’s your HEART! And it’s the greatest gift you can give Jesus. We made this gift box craft for you to color + cut + build, so you can hold this message within your heart. Go on and pop some confetti to celebrate and start craft time! All you’ll need is some color of any kind, scissors and glue — easy peasy. you can give Jesus is your heart. And that is a very very precious thing! Even though we get gifts at Christmas, there is a very special gift we can give daily to the Lord. Use this activity to refocus your little makers on what the holiday season is really all about.